The MV Agusta 750 Sport was race-bred. Indeed, a line could be drawn from this 750 roadster through to the 'Gallerate' race-bikes. And they ruled the 2-wheeled GP roost at the time. The 750 Sport's clip-on 'bars and humped-back seat screamed racing. The 4-leading-shoe Grimeca front brake - and chrome quartet of megaphone exhausts - were clear pointers, too, to the bike's race-track roots. The 750 Sport's top speed of 120mph was good going in the Seventies. Especially since the bike was a tad portly - weighing in at 506lb. Its in-line 4-cylinder engine produced 69bhp - at 7,900rpm. Power was delivered via gear-drive - spinning twin overhead camshafts. Sat next to its rivals in the showrooms, the 750 Sport was a pricey buy. As a result, it did not sell well. The complexity of its engine - and labour-intensive production processes - counted against it when it came to price tag time. Looked at from a purely commercial standpoint, the Sport was just one more nail in MV Agusta's coffin! 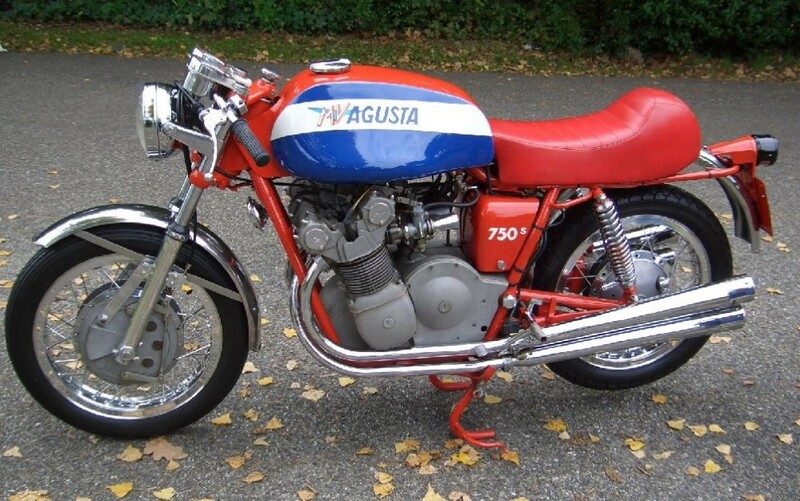 Domenico Agusta - the firm's founder and driving force - suffered a fatal heart attack, in '71. With him went the soul of 'MV'. It was not long before the marque shut up shop. It is sometimes hard to convey to those who do not 'get' motorcycles, just what it is that holds spellbound those who do. A bike built by MV Agusta makes it so much easier to explain. For many, MV encapsulates the spirit of biking like no other marque. Without doubt, the MV Agusta 750 Sport played its part in that!